BENGALURU (Reuters) - Rice export prices fell a the second consecutive week in India on a weakening rupee and slow demand, while strict inspections from top consumer China muted exports from Vietnam. India's 5 percent broken parboiled variety was quoted around $364-$368 per tonne this week, from $366-$370 the last week. 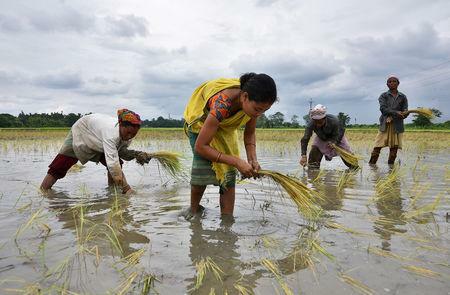 In neighbouring Bangladesh, rice imports in July-November stood at 106,640 tonnes, the country's food ministry data showed, after the government imposed a 28 percent tax on shipments to support its farmers after local production revived.